By James E. Eash, D.D.S. Stained teeth can be embarrassing — so much so you may even hesitate to smile. Before you seek out a whitening solution, though, there are a few things you need to know about tooth staining. Tooth staining is more complex than you might think. There are actually two types: extrinsic, staining from foods and other substances of the outer surface of the enamel; and intrinsic, discoloration deep within a tooth that affects their outward appearance. The latter staining has a number of causes, including the type of dental materials used to fill a tooth, a history of trauma or the use of the antibiotic tetracycline during early tooth development. There are some noticeable differences between the two types, although an examination is usually necessary to determine which you have. Extrinsic staining tends to be brown, black, or gray, or occasionally green, orange or yellow. Intrinsic staining can be red, pink or, if caused by tetracycline and fluoresced under ultraviolet light, yellow. If only one tooth is discolored it’s most likely intrinsic due to decay in the tooth pulp. What can be done also depends on which type. 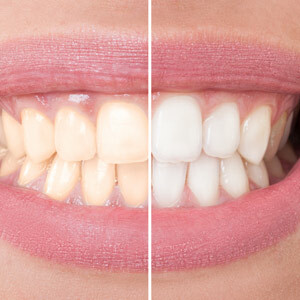 Extrinsic staining can be modified through whitening, with either an office application or a home kit (there are differences, so you should consult with us before you decide). It may also be essential to modify your diet by restricting foods and beverages (coffee, wine or tea) known to cause staining and by eliminating tobacco use. You should also practice daily hygiene, including brushing with a toothpaste designed to diminish staining, and regular office cleaning and polishing. Intrinsic staining can’t be addressed by these methods. Instead, you may need to undergo a procedure where we enter the interior of the tooth and insert a bleaching agent. If this isn’t an option, you can also choose a cosmetic restoration such as a porcelain veneer or crown that will cover the tooth to better match the color of your other teeth. Dealing with stained teeth begins with a visit to our office to determine what type of discoloration you have and to learn your options. But regardless of what type you have, there is a way to a brighter smile. Clear Orthodontic Aligners: Are They Right For You? Can You Envision Your Ideal Smile? What's The Difference Between Bridgework and Dental Implants? When Could Bridgework Be Preferable to a Dental Implant? New Permanent Teeth - Faster Than Ever! Do Clear Orthodontic Aligners Really Work? Second Thoughts on Tongue Piercing: Should You Remove Your Tongue Bolt? Why Does My Dental Hygienist Ask So Many Questions? Are Porcelain Veneers Right For You? Take Our Quiz: Are You At Risk For Tooth Decay? Braces and Other Orthodontic Appliances: Which Type Is Best for You? How Does Fluoride Protect Your Teeth? Are Tooth-Colored Fillings Right for You? Do You Need A Smile Makeover? How Much Do You Know About Nutrition and Oral Health? Cracks in Corners of the Mouth: Are They Serious?